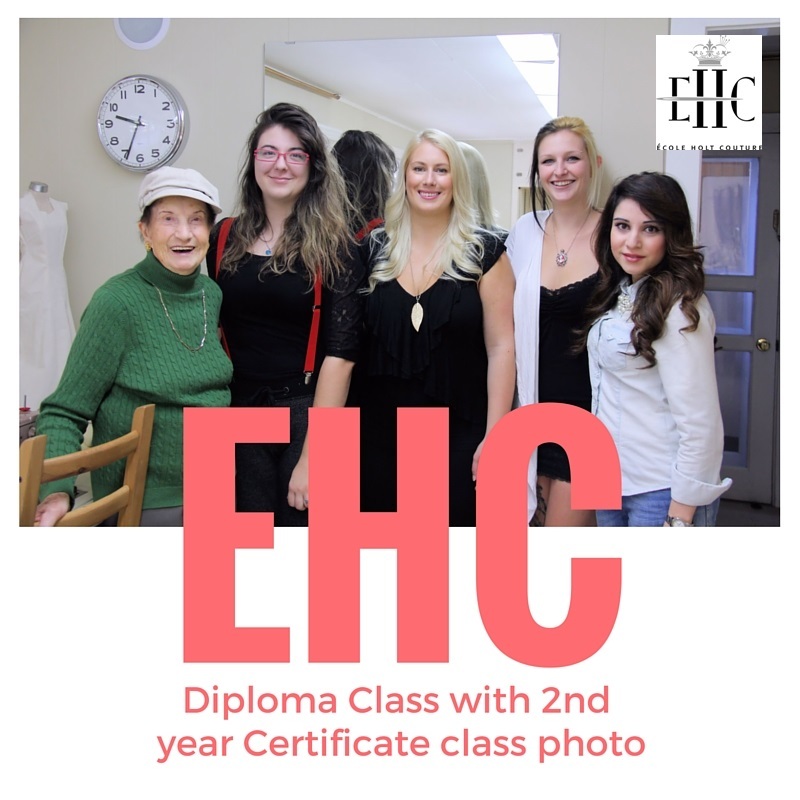 One of the greatest pleasures at Ecole Holt Couture is celebrating well deserved credit for the tremendous effort and progress that EHC students have made since beginning in September 2017. This year we are between Graduation goal posts, so we decided that a class luncheon date would be very welcome. Bonterra Trattoria in Calgary’s belt line district was the restaurant of choice on this sunny Friday afternoon. Of particular enjoyment for me, as lead instructor of this class, was the luxury of just hanging out with 6 amazing talented individuals whom I normally don’t have the opportunity to relax and chat with. Our teaching intern, an EHC Diploma graduate, is an invaluable asset to the group contributing many hours of advice and support to each of the students. Having plans to travel the world in the future, will do very well combining her couture training and experience, cultural background plus a university education under her belt. We are very glad to have her on staff while we can! We are interested in our students beyond their training and performance at Ecole Holt Couture. Their range of ambitions is wide and far reaching from further developing a career in Indigenous Fashion [see also http://ifwtoronto.com/ ], or taking control of unique design ideas by introducing them fully developed to the market, and transitioning from or combining Eco rehabilitation with fashion, or offering truly appealing and well fitting fashion for the not-so-common shape or size, to a career based on theatrical fashion culture. Whatever, their plans and aspirations are, the students will acquire the tools and skills to begin traveling upon their life-long creative journey which will certainly evolve from one form to the next, and I’m enthusiastic for each one of them. In the meantime, required term projects must be completed and submitted and another school year will commence after a well-deserved summer break – or is it a longed-for period of uninterrupted sewing time! (Hm-mm, perhaps that may be my own aspiration for this summer). 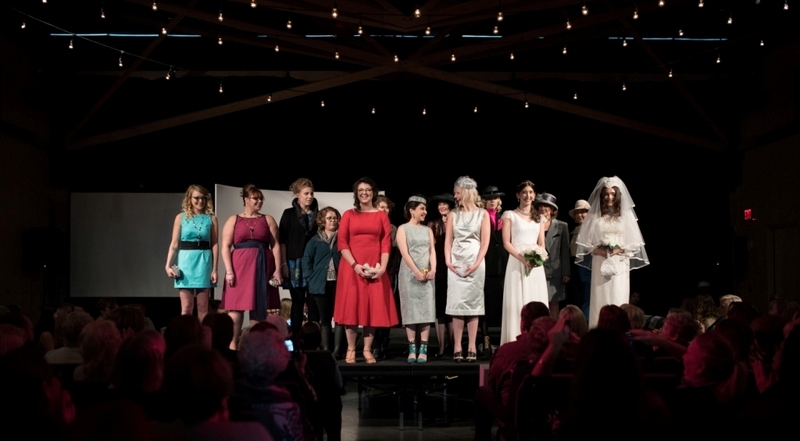 Ecole Holt Couture | This could be for you! Our version of ‘string theory’, tells the story of how being successful in couture and tailoring doesn’t just rely on prevailing external factors, but rather on the resources you own and engage – such as your trained mind and your hands. To explain why EHC’s teaching and mentoring method is focused on more than just skills training, and why we feel it’s important to share and promote our love and passion for couture and tailoring is another little story illustrating the difference between a fully trained professional sewer and one that truly has passion for the craft. ‘When asked by her daughter what she was working on, her mother replied, “Oh, well, I’m stitching these tailored buttonholes by hand”. Daughter, “Really, why by hand?” Mother, “Because, this is the ‘couture’ standard, and that’s what my clients expect”. But, stated by a truly passionate couturier, the same question. Lesson #2 – Petite is Powerful – tips for a great fit. If you are like me, considered a petite size, then your proportions are slightly shorter from the shoulders to the waist than a standard size, and you all know what I think about ‘standard’ sizes. But being ‘petite’ may also reflect that you may perhaps be relatively shorter in stature than most of your contemporaries in North America. Not at all if you are in most parts of Asia and in some parts of Europe. Wearing off-the-rack and ready-made garments always seem to appear slightly ‘off’ because, petite manufactured garments are mostly only adjusted for the above mentioned variance, or worse – adjusted for shorter arm and leg length as well which may not apply at all to you (or to me). These adjusted variances may greatly reduce the choice in ready-made or off-the-rack for you to look amazing. If you want to look your perfect-size ‘perfect’, then every component needs to be made in proportion to the whole. That doesn’t mean a petite cannot wear a large pattern print, or conversely that being tall you cannot wear small prints. Only that the proportions must be adjusted accordingly as is true to haute couture and bespoke tailoring. In this example, notice that in her riding jacket all the components – lapel size and stance, buttoning, pockets, sleeve length (and armhole circumference), waist cinch, and jacket length are all relative to proportion. The trousers again are the right length and leg width. Any one of these elements out of proportion will throw the whole look ‘off’. A petite can look positively overwhelmed or underwhelmed because of the lack of choice. Remember that in garment manufacturing, realistically it can only serve a small section of the market offering a limited range of ‘sizes’ to be profitable. That pretty much excludes the other 90% of the population. It is not you, you are a perfect size. Thursday April 14th from 7 to 9 pm. *Registration deadline date for the seminar closes Monday April 11th. 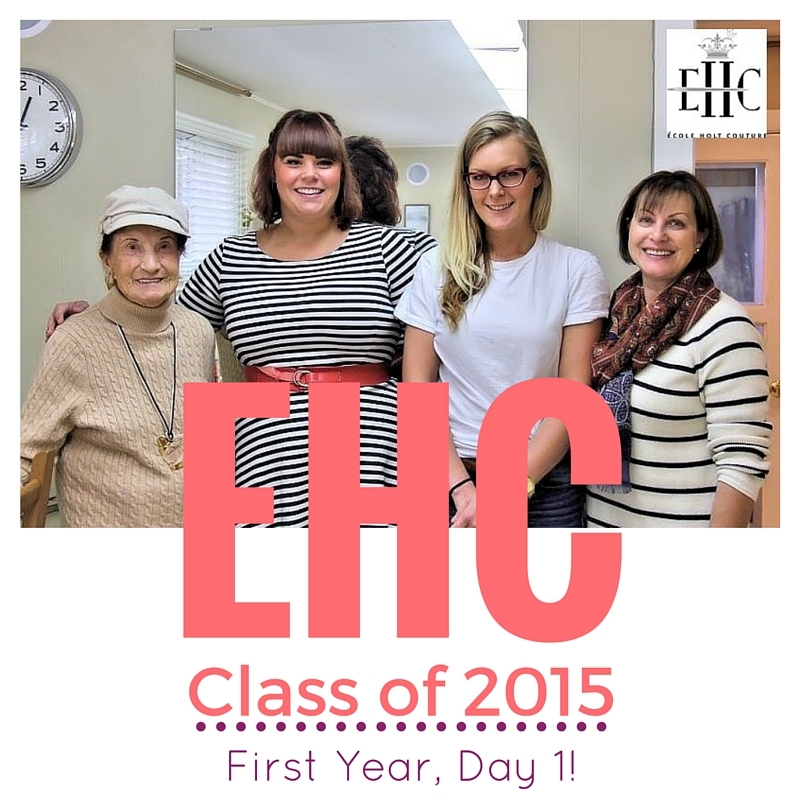 First, to make your application for enrollment, contact EHC by phone or by email requesting a Prospectus. Then, because École Holt Couture School of Couture Sewing and Design’s curriculum is truly unique, we schedule an information seminar at the school to help you decide whether Ecole Holt Couture School of Couture Sewing and Design is the right fit for you. In summary – what you need to know before you start. Each school Year begins in early September and ends the following June. The year consists of 3 Terms which each run 10 consecutive weeks, including a break between each term. Classes are held twice weekly for 10 hours, or 5 hours per class, including a short lunch break. The remaining 3 days are required for lab (or homework) mandatory studies which takes up 30 or more hours per week. You must expect to dedicate 40 hours per week for classes and homework during the year to successfully complete each program. Very important: Students must have free access to a dedicated work space or studio in which to do homework projects and assignments. Ideally a separate room, with good natural, ambient and task lighting, preferably self-contained and protected from through traffic and everyday disturbances. (What we are saying is, using a kitchen space is not acceptable). Your studio space could be accommodated within your bedroom area – if no other suitable space is available. 1. Request a Prospectus by telephone or email. 2. After you receive a Prospectus, review all the information carefully. 3. Return your signed and completed application forms, by the stated deadline. Only completed applications are reviewed by the school’s selection committee. Letters of acceptance (plus required tools/materials list), or letters of regret, or waiting list letters, are forwarded to you within 6 weeks of your application being received by EHC’s registrar. *Email info@ecoleholtcouture.com for current application deadlines. Equipment $2000 – Most of this initial equipment cost is good for both programs and should last you for many years thereafter. *Materials $3000 – Students are given a resource list to search out and purchase their own required materials as they become necessary for projects. Equipment $2400 – This advanced equipment in addition to the Certificate program equipment, is useful not only for school use, but for use after graduation for many years to come. *Materials costs vary widely and are subject to market fluctuations. A financing schedule for Tuition fees may be available for Registered students. What do I do with all my projects at the end of the program? Each year in November EHC presents a fashion show, open to the public, to feature the couture garments students have created. Graduates of the Diploma Program will have developed outstanding wardrobe items consisting of approximately 30 – 40 full scale, plus 10 – 20 half scale couture garments, and accessories valuing more than the total investment in tuition fees and materials combined. Each project garment increases in complexity of style and design, and reflects, of course, the student’s increasing level of skill and competency. All garments created during the program are designed to be completely wearable and reflect a tangible portfolio, which exhibits the skills and experience graduates will have acquired during their time at Ecole Holt Couture. We posted this one year ago, but still a good story to illustrate a point about the value of couture sewing skills…Happy 2016! I’ll leave this one with you as well: Without Craft, inspiration is a mere weed in the wind. Once upon a time there was a very rich man and his wife spending some quality time together on their private south pacific island. Even with its remoteness it had every modern convenience. Solar panels for electricity, running water, and even 4G Internet access. Everything you could possibly need was there. A beautiful house, airstrip, dock, boat house, deep-sea fishing boat, and several guest cottages on its beaches. He arrived following several strenuous business trips with his wife, who had completed a major shopping spree from Paris, Milan, London, to Tokyo. There was nothing that the couple could not buy. His wife had just procured lengths of the most elaborately hand-embroidered French silk, the softest Kashmir wool, the most luxurious Italian silk velvet, and the finest English worsted. The best that could be made, very expensive and all quite unique. Because this man was also very generous he regularly invited friends and relatives to his island, but he also invited strangers from time to time to share in his good fortune. This time he invited three young, and very promising, fashion designers to the island as a reward for their contribution to one of the many charities he supported. Each of the three individuals saw this opportunity differently. One was very ambitious and viewed each day as potential for new business and so brought an iPhone, laptop, latest look-book, and a few new design ideas to present, just in case. The other viewed this as a good time to get on with a project or two without distractions, and so managed to pack a compact sewing machine, sewing kit (thread, pins and scissors), and some new patterns but decided to investigate locally made materials on the island to experiment with. The third accepted this, as a time to relax and not worry about anything. To absorb, and enjoy this once in a lifetime experience. While on the island, which was very tiny indeed, it became apparent just how remote it was from civilization. The owners of the island were very hospitable and made time to visit with each of their guests, making sure that everyone was quite comfortable. One night they invited the three young people to dinner at the big house. Nothing but the finest was offered, the freshest fish caught just hours earlier, the best quality vegetables and most exotic fruit flown in from the nearest islands, and the finest wines. The conversation turned to each guest to find out what their hopes and aspirations were for the future. One was confident that someday they would become world famous, so that everyone would want to own one of their designs. The other was hopeful, that with experience and some help, they would be able to manufacture highly popular collections selling around the world. The third confessed to wanting to be creative every day, to being content, and wanting to make other people happy. The others all sniggered at the third’s response, and privately thought how impractical and unrealistic that would be. Curiously, the rich man’s wife asked more questions about why this would be a considered career choice. After all, doesn’t one need a lot of money to be able to have everything one’s heart desires? “For instance, we have everything one could possibly want, a good income, good health, and access to the best of everything. This doesn’t come without hard work and sacrifice of course”. All had to agree, and continued to enjoy a pleasant evening of good food, conversation and exchange of ideas. Not to worry the first designer said, “I have some really good people behind me who will get it done right”, the second designer remarked, “I will make it myself, it won’t take long. I can usually run things up in a few hours, a couple of days at most!” The third’s reply was “I would love to make it for you, it will take some time. I want to make sure everything fits just right, and makes you look marvelous. Your fabrics will deserve the utmost attention, for the most part they will be hand-sewn”. That night a tropical storm knocked out the 4G Internet access, the docks were damaged, and the airstrip was littered with debris from broken branches. Fuel supplies were so low that the generators couldn’t be run for more than just the bare essentials – such as pumping fresh water. Repairs would take some time. The first designer conceded, “Well that pretty much finishes my plans, without the internet I can’t communicate with my team, my laptop battery is low and in need of recharging, but I can’t do it without electricity”. The second designer complained that without power the sewing machine was useless, and it was too late to order patterns on-line. The third said, “No problem. Let’s get started”. In wonderment, the rich man’s wife asked how this is possible without any equipment! “I have my hands, I never travel without my emergency sewing kit, and if you have a ball of string somewhere, that’s all I need.” And so proceeded to take her measurements with the ball of string, sketched some ideas on paper for her approval, and drafted the patterns on old bed sheets. After assembling the mock-up designs, they were fitted exactly to her figure. Then used as the pattern to cut her prized fabrics. During the following days, the rich man’s wife witnessed how the garments were being created piece by piece, all with the greatest care and attention to detail. Every pattern was skillfully matched at each seam. The garments were fitted a few times making sure they were comfortable and flattering to her figure. Then – one day the clothes were complete! “Oh my, I have never in my life seen such craftsmanship, such beauty, but mostly I have not felt so comfortable in my clothes, and felt so good about the way they make me look! I could see your joy while you worked, and why you love creating such wonderful things! How can I thank you enough for what you have done for me?” The young Couturier replied, “The opportunity you’ve given me has been priceless! Here is a detailed invoice of what you have received in exchange for my expertise.” The rich man’s wife never again wanted what everyone else could buy! Do you? 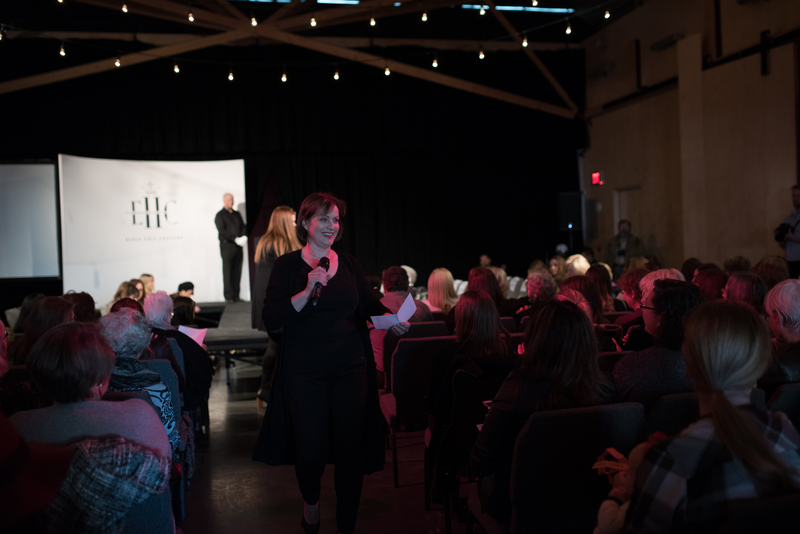 Questions, questions and more questions at Ecole Holt Couture! After being on a blog hiatus for a bit, we thought that we would start our blog back up in September 2015 with what we do with student’s questions, and we encourage our students at École Holt Couture – School of Couture Fashion Sewing and Design to ask lots and lots of questions. After all, we are here to share what we know about our area of expertise. Some questions require multi-dimensional answers. In other words, the answer depends on the specific situation “if this, then do this”, when all that is wanted is a simple directive to “how do I do this?”. So, the strategy goes like this. At the very beginning, we say “it doesn’t matter why, just do it this way”, which later progresses to “do it this way, but in certain situations do it the other way”. In advanced classes, we give several answers to a single question, but each answer is quite relevant. Later still, the students are encouraged to come up with their own thought-out solutions and to bounce them off the wall with us. Finally, the goal is that students work through their questions and problems based on relevant research plus what they already know in some form, and can defend their solution paths. It is at this point when we can breathe out a happy sigh and know that we’ve done our job reasonably well. There are better ways and not-so-successful ways of doing things to achieve a result. Nothing is written in stone, and it is universally accepted, or least it should be, that no one should have to reinvent the wheel to be a highly skilled creative type, and yet still considered to be ‘original’ in their art form. No single person knows everything there is to know about any single thing. So we continue to learn throughout our careers and lives, and we learn from the experience of others before us. It saves a tremendous amount of learning time, unless we are stubbornly determined to engineer a new pattern for the wheel. We also encourage you to never stop asking the tough questions. Never be satisfied with a simple answer, but don’t over complicate things just because you can. The best solutions are sometimes very simple and sometimes very complicated. Sometimes they require a team to figure it out, sometimes they just require an unexpected ‘Ah-ha’ moment. Sometimes they need in-depth explanation and sometimes they just need an act of faith.